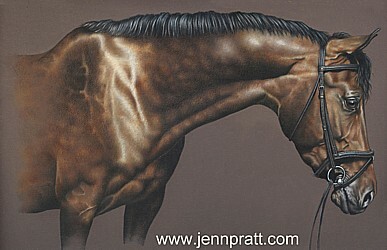 Artwork of my Muse – Illy | Jennifer Pratt Equine Artist. Illy has a sloping neckline, naturally curly forelock and a gleaming coat all year round. For her artwork, I wanted a pose that was just indelibly her, and this drawing was it :)Please read more about Illy on her own page, posted on the side, labelled My Muse. I want to remind readers that I am maintaining two blogs, this is my studio blog, devoted to commissioned works in progress, past works and other originals. My other blog, http://sporthorseartwork.wordpress.com is devoted entirely to my original series ‘Canadian Bred’, be sure to visit over there too!! WOW, lovely work Jennifer! My first thought when I viewed this work of art was, “My what a beautiful sweet horse!”. You put so much kindness in her eye. Thanks for sharing this painting. You are a lucky person to own such a horse.